When this form is completed, the thankyou.htm that I have loaded into the form does not display, instead the following displays and the line cannot be read. Why is this happening - I have reloaded it so many times with the thankyou.htm page, but it will not display it when the form is completed? I've checked the website and the form you have. The condition you setup is a "Thank You" message when the submit button is clicked. 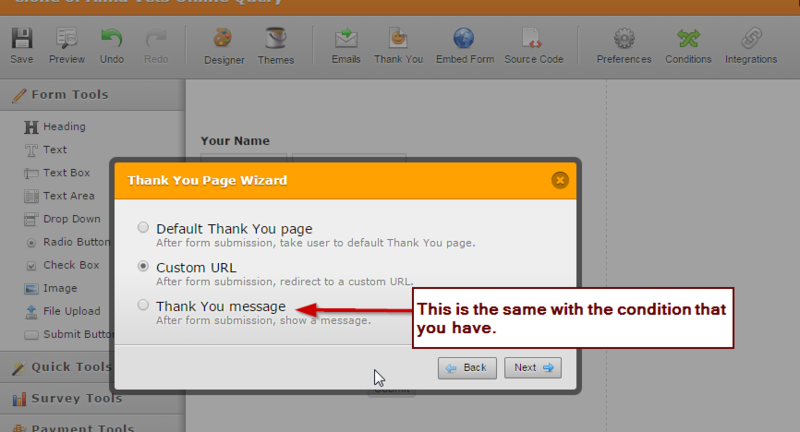 The setup to display a message in your condition is actually the "Thank You Message" found in the Thank You Page wizard. That is why you are not being redirected to http://www.almavets.co.uk/thankyou.htm, because you are using the 3rd option in the Thank You page wizard using the condition. You should disable or delete the condition and try testing again your form in your website.